Our word of the week is quaresima, the Italian word for Lent. This is the period preceding Easter, which celebrates what Christians believe is the resurrection of Jesus of Nazareth after his crucifixion. Today, Tuesday, is martedi' grasso (Fat Tuesday, or mardi gras in French), the day before Ash Wednesday (mercoledi' delle ceneri). The reason these peeps in historically Catholic countries or cities (like Brazil or New Orleans) like to carry on like there's no tomorrow is that during Lent you are supposed to give up stuff, especially yummy stuff like meat. Since Catholics knew that a period of deprivation was around the corner, they went hog wild just before the beginning of Lent, with Ash Wednesday being the first day of deprivation. 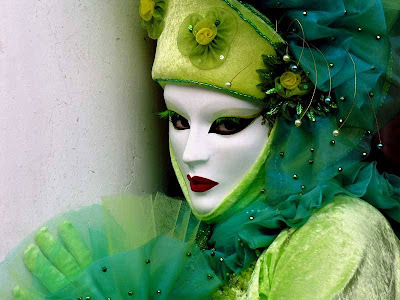 So the period before Lent is a time of compensatory celebration, called Carnevale in Italy. The word Carnevale apparently comes from the Latin carnem levare, to take away meat. In fact, historically Catholics gave up meat and other pleasing stuff during this period. A kind of Christian Ramadan. You may still see Catholics with a smudge of ashes on their forehead tomorrow. Do not be culturally insensitive and ask them if they haven't washed their face. You may have noticed the word quaresima is similar to the word quaranta, forty. In fact, Lent is about forty days. At the end of which we have Easter, and springtime.